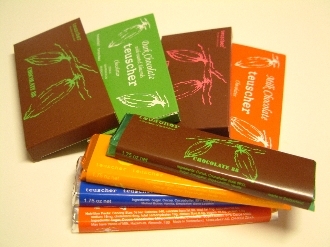 At Teuscher we put the same amount of care into the making of our chocolate bars as we do into the production of our famous truffles. Our boutique chocolate bars are crafted according to Swiss tradition, using all cocoa butter instead of cheaper hydrogenated oils or dairy fats. From rich, creamy milk chocolate, plain or with Hazelnut Gianduja filling or Crispy Nut Praline, Creamy Truffle filling to white chocolate, rich in cocoa butter with a hint of vanilla. Our light chocolate bars are a delight of balance between delicate cocoa and milk tastes and delicate, luxouriously sweet accents. Our dark chocolate bars range from a semi-sweet at 55% to bitter-sweet around 77% and 88%, to a bar for bitter chocolate lovers at the 99% cocoa content level. The purest way to experience chocolate!